Hi folks, Leandra back again for our 3rd night of the August 2014 new product launch. These are always exciting times for us after months of planning and preparation. 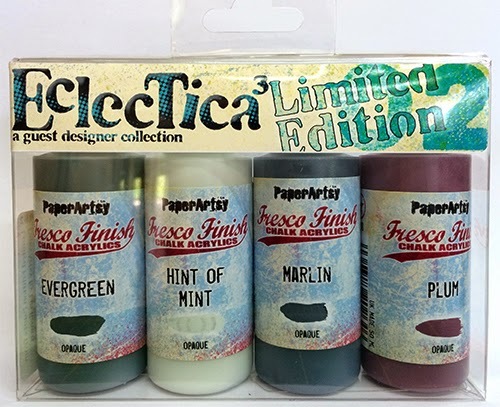 Every 6 months when new releases are revealed the number of products we announce seems to get bigger and bigger as the PaperArtsy designer family grows bigger too. Tonight it's the turn of my buddie Linda Brown. Lin and I decided it was time for some new Christmas phrases, so she did the hard work and pulled these quote plates together (ELB11/ ELB12), but of course, she also carved up a storm with some lovely new focal images too, and of course she has another Limited Edition Paint set which features gorgeous heritage-style winter-tone paints. Once you see them in action below I'm sure you'll be hooked! "Hi Lin here, I am very excited to be able to share the official launch of my new winter stamps and limited edition paints. I absolutely love quotes and phrases, so I am delighted that I had the opportunity to have a few of my favourites made into rubber and hope that they become your favourites too. I'm going to stop with the introductions now as I have A LOT to share this evening, I have a trio of trios for you..."
"Our very own JOFY is extremely fond of bunting and I can honestly say that this first project was hugely influenced by Jo." I used three pieces of 6" x 6" grey/whiteboard and cut three triangles. Before base coating them with Hint of Mint (one of my new Fresco colours), I hole-punched the top corners. 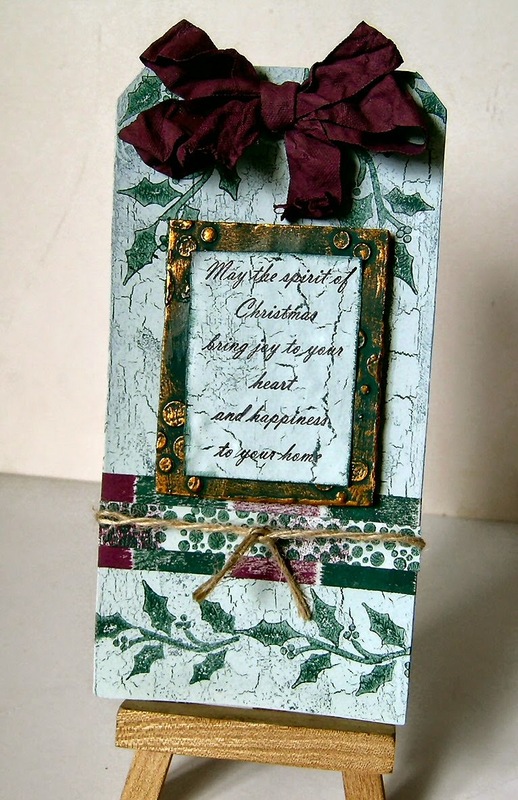 I created a new colour with some Hint of Mint and a few drops of Evergreen, I applied this generated colour to my new snowflake stamp (ELB10) with a small piece of Cut 'N' Dry Foam and printed carved snowflakes over one of my triangles. Moving on to the two remaining triangles, I used just the star from my wordy Christmas tree (ELB11) to print a border of stars on each triangle, using my custom mixed colour. 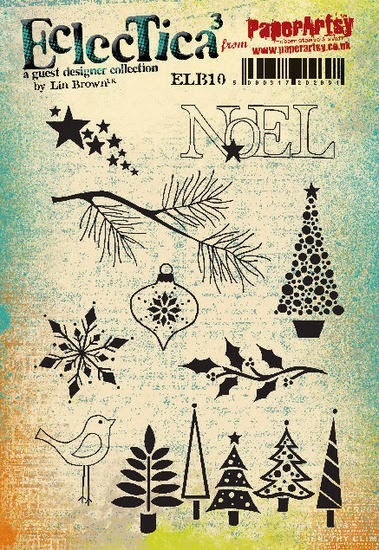 With the Evergreen paint, I printed the 'greenery' (ELB10) and '25th' stamps (ELB11), then used some Snowflake to stencil some dots in the gaps through stencil PS001. I embossed the little bird with gold embossing powder before cutting him out and painting him with watered down paint. For the right hand panel, I turned the 'greenery' stamp upside down so that I could print it from the opposite edge and repeated the techniques that I previously used but made two baubles instead of a bird. Back to the centre panel. I really loved this background and didn't want to cover it up so a last minute decision to keep it simple achieved just that. 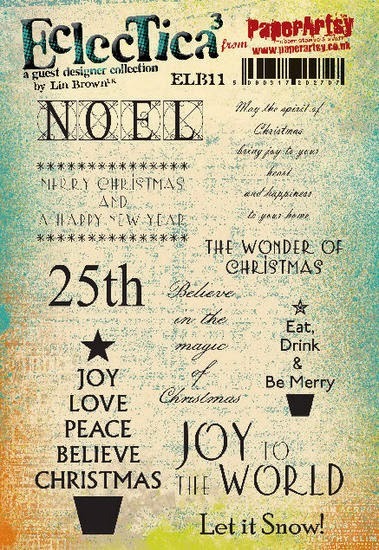 I embossed the 'Noel' stamp (ELB11) and extended it a touch by cutting out each square and mounting on a painted piece of card. I found the perfect colour ribbon to tie them all together but of course you could paint the ribbon yourself if nothing in your stash is quite right. "I decided to step away from the greens and move on to blue, in this case Marlin. 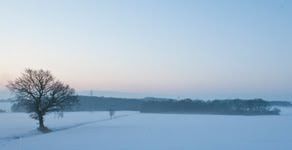 It is a greyish blue and it does work beautifully with Hint of Mint." I found some chipboard frames in my stash which I thought would look pretty good, these were from Bazzill but of course you could use any chipboard frames or even cut your own. I cut two small ovals from some heavy weight Smoothy card, this would become the centre piece for my double sided tree ornament. Having stamped 'newsprint' images in black archival ink (HP1108, or HP1207) I painted the edges of the frame with Marlin and added a touch of random gold embossing, I sandwiched a piece of ribbon between the two frames, making a loop at the top. After painting both oval die cut shapes with Marlin and embossing one the trees from the row of trees from ELB10, I used some multi-medium (matte) to glue them back to back, sandwiching the ribbon between them. Not wanting to waste anything, I used the middle piece of my frame to make another ornament. I sponged some Marlin on the edges of the oval with Cut 'N' Dry foam. Stamped the sprig of holly (ELB10) with Marlin and used a black pen to add some detail to the leaves. I used Wendy Vecchi's Cornflower Archival ink pad to stamp the bird and dipped the end of my paint brush in some ink from a gold Krylon pen to add the gold dots. I stamped the bird again on some printed paper before cutting him out and layering over the original bird. To complete my trio of ornaments, I die cut some grey/whiteboad with my Tim Holtz Movers and Shapers ticket die. It's the perfect size for this sentiment (ELB11). 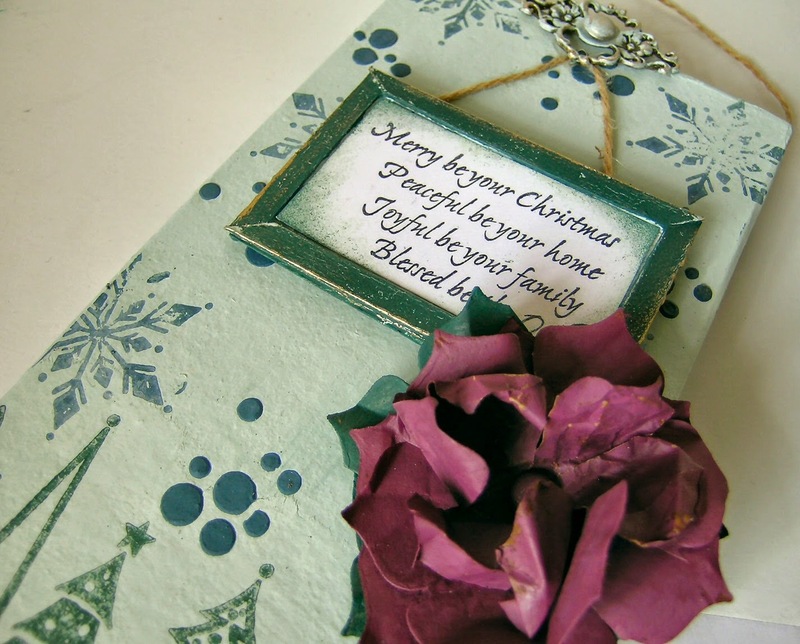 "And last but not least, my trio of gift tags. I wanted to make these using my new Plum paint which also works beautifully with a Hint of Mint, which is fabulous as Hint of Mint could quite possibly be my new favourite colour!!!" 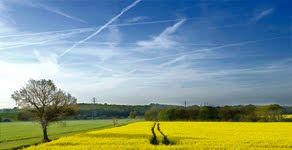 These tags are very simple, quick and easy which is exactly what you want at the busiest time of year. Having base coated my tags with Hint of Mint, I stamped the sprig of holly with Snowflake all over them to create a delicate background. Then using Jet Black Archival ink, I stamped the messages in the middle and filled in any gaps with a selection of stamps using Plum paint. A little Plum is also sponged around the edges of the tags....job done!! "I'm sure this will give you some quick and easy makes to refer back to when the Christmas rush hits your home! Enjoy!" Thank Lin, and congratulations on another great product release! When it comes to Christmas and all the time pressure we invariably place upon ourselves, some quick Xmas makes are ever so helpful! To support Lin tonight, we have one of her biggest fans, Sue Carrington, who has also used all these new stamps to great effect, take a look below! I cut a tag from Smoothy Heavy card and painted it with Evergreen Fresco Finish paint, dried it off and then added a layer of CrackleGlaze. Once this was dry a top layer of Hint of Mint Fresco Finish was painted over it. 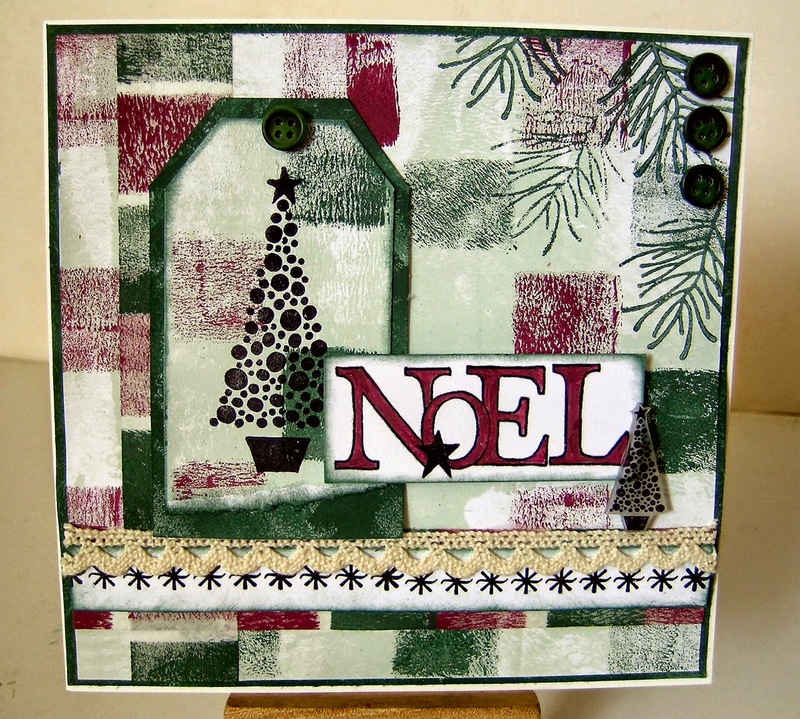 I stamped the holly from the ELB 10 stamp set using Evergreen Fresco Finish paint. The panel was cut from cardboard and I used Grunge Paste with the Lin Brown 001 stencil. I then painted it with Evergreen Fresco Finish paint and when dry, rubbed some Renaissance Treasure Gold over the top. The sentiment is stamped on to a piece of fabric that I’ve painted with Evergreen, then added a layer of Crackle Glaze and a top coat of Hint of Mint Fresco Finish. The bow is made from seam binding that I’ve painted with Plum Fresco Finish. I added a border of masking tape which I created a check design on and on top of that card that’s been stamped with the little tree from the ELB10 set. I made a master sheet from Smoothy card that I first painted with Hint of Mint and then using masking tape created a checked design. I brayered over the top with Plum and Evergreen Fresco Finish paint. I cut a piece from this sheet to make the background. I stamped the branch over the top corner using the stamp from the ELB10 set using Evergreen Fresco Finish paint. The tree from the ELB 10 set has been stamped with Jet Black Archival ink and clear embossed onto a small piece of card from the master sheet, cut into a tag shape and I’ve ripped the bottom edge at an angle. This is mounted on card that has been painted with Evergreen Fresco Finish. 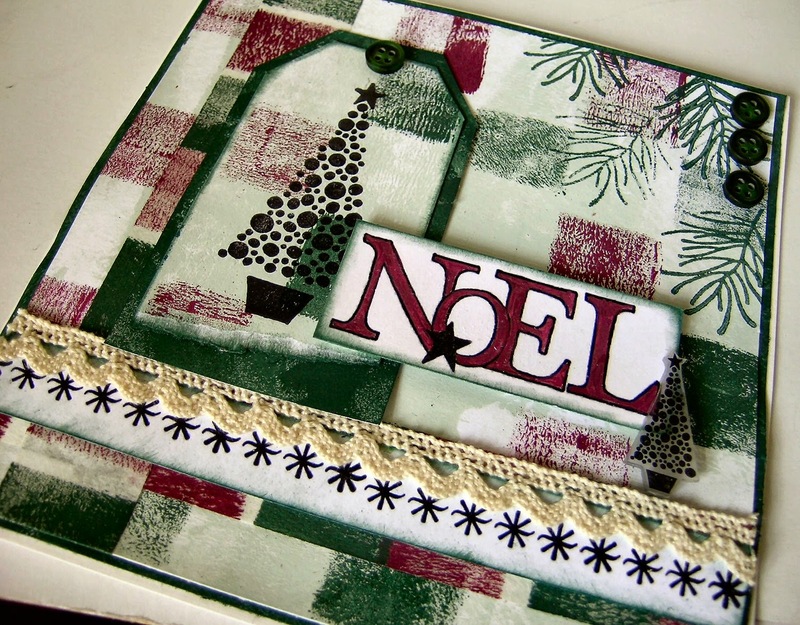 The word Noel has also been stamped and clear embossed then I’ve painted it using Plum Fresco Finish. I stamped a border using the stamp from the ELB 12 set and mounted it onto some masking tape used to make the master sheet. The small tree is made using shrink plastic and the stamp from the ELB10 set. I’ve added some lace and buttons to finish. I painted the chunky board with Hint of Mint Fresco Finish. 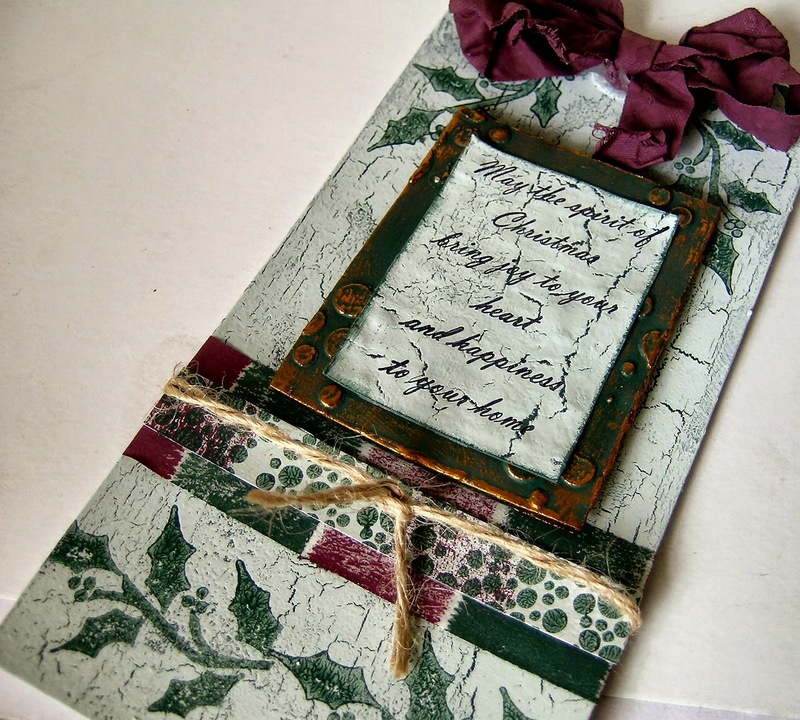 I then stamped the border of trees using Evergreen Fresco Finish onto some tissue paper. I painted over the back with more Hint of Mint Fresco Finish and stuck the border to the board. I stamped the snowflakes from the ELB 10 set with Marlin Fresco Finish and when dry, I washed over them using watered down Hint of Mint. I mixed some Marlin Fresco Finish with Grunge Paste and added some dots using the Lin Brown 001 stencil. The panel is made from cardboard and wooden coffee stirrers to make the frame. I painted it with Hint of Mint, then spread some CrackleGlaze over it and when dry, a coat of Evergreen Fresco Finish. I rubbed a little White Fire Treasure Gold around the edge. 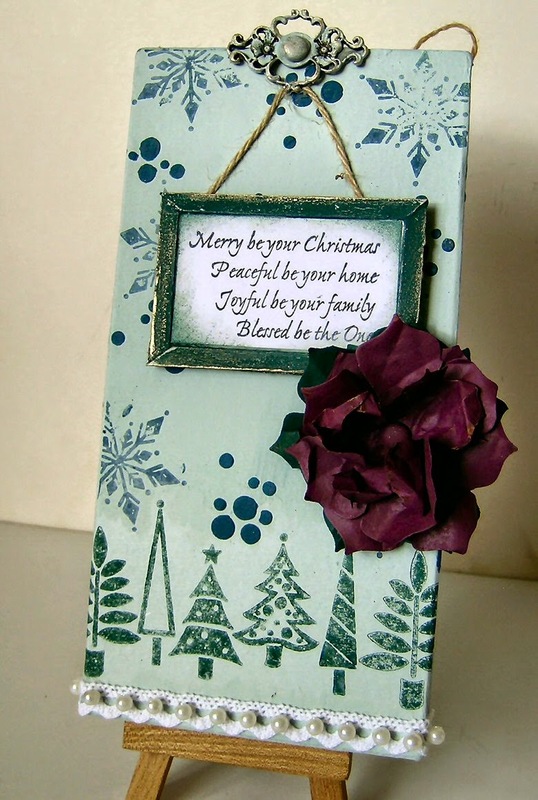 The sentiment is from the ELB12 stamp set and is stamped onto Smoothy card and I’ve sponged a little Evergreen Fresco Finish around the edge. I then painted some Crunchy Paper with Evergreen and Plum Fresco Finish and die cut several flowers using the Scallop Flower die and layered them up, using a painted brad to hold everything together. The metal embellishment has been painted with Hint of Mint Fresco Finish and lightly brushed with WhiteFire Treasure Gold. Wow, more great inspirational ideas, huge thanks to Lin and Sue for another wonderful night of new products! Of course, as you are getting the swing of how this works now, we'll be back tomorrow with another returning designer, and of course more amazing projects! See you then! What wonderful samples, so many unusual features. I am in love with marlin at the moment! Fantastic stamp sets & all the projects are completely gorgeous. Lovely new stamps, gorgeous makes! Oh crikey, I can hear my bank card groaning already, lol! Lovely sets of stamps and all the projects from Lin and Sue are wonderful. I am really yearning for those awesome paint colours, they are just stunning. Oh my! I love every little thing about these projects! What wonderful inspiration. Thank you for not using the typical Christmas colors; it's all beautiful ! 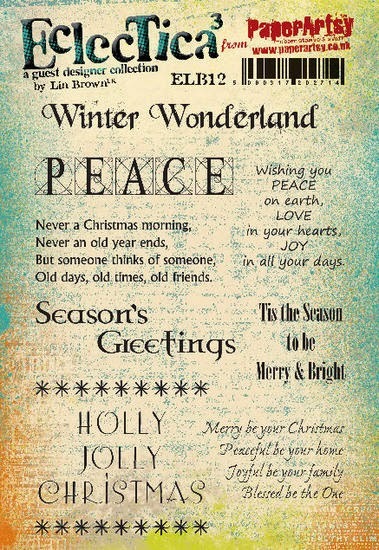 Love Lin's new stamps and both Lin and Sue's projects are fabulous!!!!!!!!!!!!! !